As most of you know I live in Florence OR. Not a good place to live if you like bright sunny days. There is very little break in the dark days, wind that blows you away, and rain. With that said you get this painting. A big thanks to Eva and Kristen for hosting Paint Party Friday. Be sure to stop by their site to visit all the other artists who have joined in. Happy PPF! a great scene with the umbrellas! And yes... we have also had have summer this year on just one day--lol! Sorry about the gloomy weather, but very nice work! This is terrific! I really feel the cold wind. Beautiful work! I can sympathize with your feelings as it is like that here, but then we are having winter here in NZ. Wonderful art comes out of lousy weather! In Portland and its suddenly hot! HPPF! Awesome painting and it looks as if you had been at my place recently! ;-) Really, we have this rainy stormy weather in the north of Germany too! Fantastic piece of art- we have lots of gloom here in London too and the wind and rain also, so I know how you feel.Happy PPF to you. Happy PPF! Love the umbrellas too! xo L.
Wonderful umbrellas. We have lots of those days this time of year...but our temp is 90. It makes for a steamy environment. wow - you really captured the struggle against the wind and rain. Hope you get a glimpse of sun! Happy PPF! LOVE your painting!!! Sorry for all those gloomy days but you have your art and your paints to add color :) Happy PPF! Love how you've got the umbrellas angled! Sorry the sun is hiding from you- hope it pops over to give you a little sunshine soon! Happy PPF! Nicole, your painting of the umbrellas is fantastic. I have tried several times to draw umbrellas and I can never get them to look right. Yours are perfect and give the feeling of a dismal day just perfectly. It sounds like you could use a trip to southern California or maybe Hawaii. We have had an awful lot of rain here in the not-so-sunny south. Today the sun is finally shining. What a difference it makes to one's frame of mind. A beautiful painting, I like the composition with umbrella gives a sense of movement! Sorry the weather is horrible. Actually today it's gloomy and its making feel gloomy too. Your piece is very expressive and I love it! Have a lovely weekend! Love your umbrella composition, and I know exactly what you mean about the gray days. Today, finally, some glorious sunshine here! I hope you're getting some there, too! Despite the dark, grey, rainy days, you are always incredibly upbeat, so the weather does not seem to affect your mood. Have a great weekend! I love your work. When I looked at your painting the song Singing in the Rain immediately came to mind. When I was little there was nothing I liked more than putting on my boots and jumping in rain puddles. We have lots of sun and way too much heat right now. I love it when mother nature plays fair but it does not seem like that right now. Fabulous painting with so much atmosphere. I feel cold just looking at it! what a glorious painting! It looks very nice to me though I'm sure a lack of sun would be dreary after a while! Well, you may be living dark wet weather, but your painting is bright and so full of life. I love the yellow hue in the background and how your people are fighting the wind and rain right off of the canvas. Beautiful. I so love this! you can almost feel the wind and rain when looking at it! Fabulous! sending lots of color your way!!!! can i send our heat and sun? it is 102 and it is 4:30 pm!!!! i think i am going to turn into a puddle!!!! wow you captured the spirit of where you live wonderfully. i sure hope you still get to enjoy it. some sunshine to you! lovely work! I couldn't live somewhere without sunshine and warmth, but it did inspire a wonderful painting! We have sunshine to spare here in Louisiana, and more warmth than we want, so I'll send you some. Beautiful artwork! 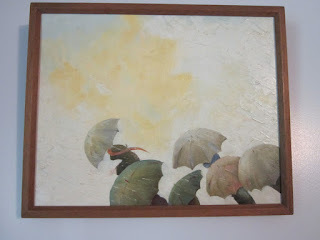 This umbrella painting is one of my favorites!